Buck slips or statement stuffers can really get noticed when you jazz them up with some special printing effects. Rounded corners, metallic inks, foil stamping, die cutting or unusual sizes are just a few of the many options available with our custom print and finishing options. Don't have a buck slip designed and ready to print? You've got options! The design of a buck slip or statement stuffer is critical to it getting noticed and acted upon. Our professional designers can make your statement stuffer stand out and get noticed to help ensure the success of your marketing efforts. 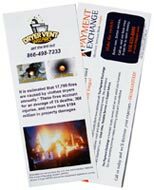 Buck slips or statement stuffers are one of the easiest and most cost-effective ways to communicate with a customer base. But they aren't just for mailings anymore! You can hand them out as marketing pieces during 'street attacks', or make them available to your customers like a flyer. PFL's buck slips, are a great way to communicate with existing customers. You can use them to introduce new products and services, publicize an upcoming event, promote a call to action, or to notify your customers of important information. Buck slips can be a relatively inexpensive way of enhancing existing interaction with your customers. Incorporate any number of custom printing options that will really jazz up your buck slips or statement stuffers. Consider embossing to add visual interest and texture. Die cutting is a fantastic way to increase interest; we can incorporate whatever shape you can dream of. Other custom printing effects include rounded corners, foil stamping, metallic inks, special coatings, variable data, and special folds. Looking for full service? If you are mailing a general correspondence and want to include a "statement stuffer", we can also print the personalized correspondence and custom envelope. We are happy to take your list and handle the mailing for you, ensuring a stream-lined and successful project from beginning to end. The staff at PFL will assist you in designing pieces that will expertly communicate the message you want convey to your customers. Buck slips are available in a variety of sizes and paper finishes that can be selected depending on the specific need. Full color printing and glossy aqueous or UV coating can help ensure that your buck slips get noticed. Give PFL a call to speak with a print expert about creating a buck slip that will get you noticed and generate the results you're looking for. Call 800-­930-2423 now or place an order online today!